What I was happy to have reason to use was my fresh thyme. Someday, I swear, I'm going to construct the world's most impressive year-round herb garden (complete with shoe-organizer mini-plots! ), but until then, I find myself all too often buying fresh herbs in presized packages, using a few sprigs for one recipe, then watching the rest wilt in the crisper. Not this time, Mother Nature! Half of my leftover thyme went into an infusion (reveal date TBD); the rest made the thyme syrup for the Fall Classic. 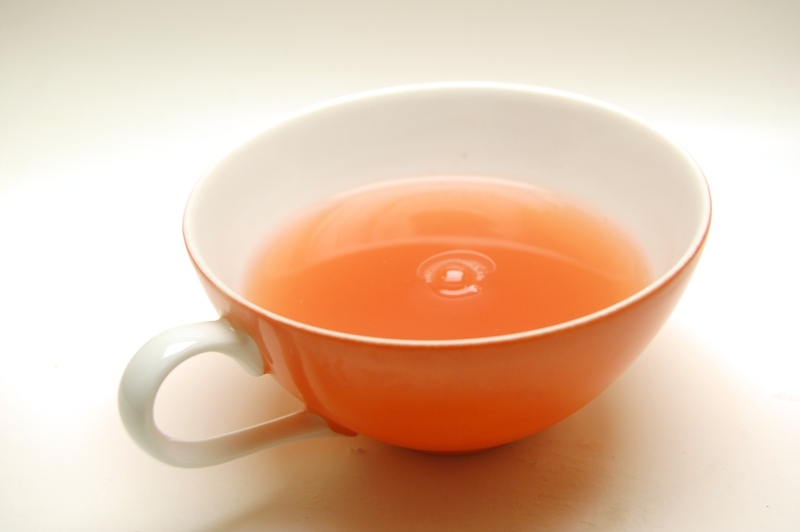 This cocktail also calls for fresh apple cider, but instead I swapped in apple-peel tea. Wuh huh? you ask, stupefied and bewildermazed. See, soon after I arrived in Canada, I decided that living here meant crafting a more wholesome and virtuous existence. Ergo, I joined the on-campus CSA at McGill. Now I get pounds of apples every week, so I make loads of applesauce. First I made it skins-on, because I figured, why bother peeling all those apples only to throw away all those peels? Then I read that Jacques Pepin recommends steeping the peels for tea. It's totes easy -- fresh peels covered in a saucepan with water, a few shakes of lemon juice, perhaps a cinnamon stick, boil 10 minutes -- and the tea comes out a totes adorbs shade of princessy pink. (Pepin recommends oven-drying the peels first, but I kept burning them so I go with this recipe.) Apple peel tea's got sweetness and tartness but none of cider's bite, and every time I drink some of it, I find myself smiling like an idiot. It's just got such a unique, comforting, soft, fresh sweetness about it. It's Happytime Tea, see! Combine all ingredients in an ice-filled cocktail shaker, shake vigorously, strain into chilled cocktail glass. Garnish as you like. The original recipe calls for an ounce of either Calvados or Laird's Bonded Apple Brandy, FYI. 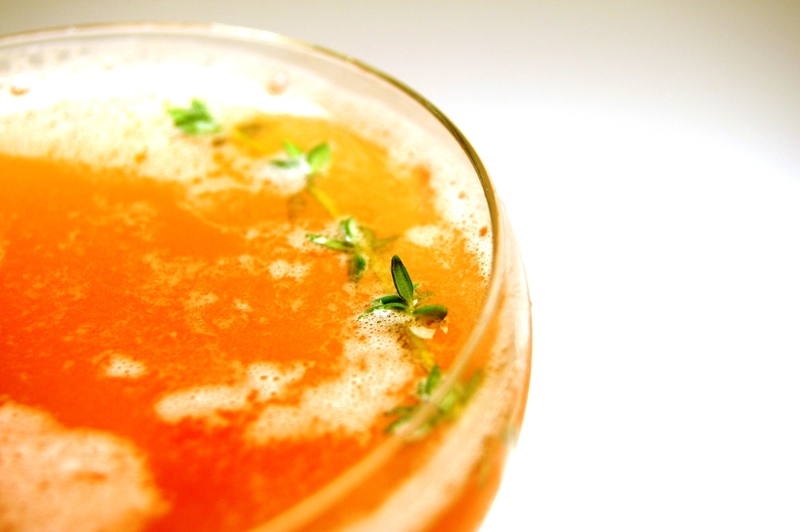 It also called for making the thyme syrup with equal parts sugar and water along with four fresh thyme sprigs. I halved the sugar because, especially with an herb-based simple syrup, I just like to make sure that the herbaceousness really comes through. I usually don't like people when I first meet them, but not Sam. On the afternoon of Montreal Bar Vs. Chef, us competitors, which included said Sam, took a written test about contest sponsor Appleton rums, then we had a break for dinner. Sam strode up to me and asked in a friendly sort of bellow if I'd like to come have dinner with them. I didn't know who them was but I said sure. Turns out that Sam is one of those folks who can make conversation with a relative stranger quite a pleasant experience, which is probably just one reason why he's so well-suited for what he does. Sam, who tends bar at Barbu but does not sell seashells by the seashore, started his presentation with a corny joke that fell flat -- something about the pun that is this cocktail's name, what with the rum from Jamaica and the getting-high like we like to think Jamaicans do a lot and the... well, you get it. Luckily, it was all uphill from there as Sam suavely concocted this most elegant libation. I was quite shocked by the simplicity of what Sam presented, considering that we were up against dry ice and test tubes and coconut shells and ingredients set ablaze. The Appleton is the only booze in the glass, and he stayed a half-ounce under the contest's two-ounces-of-hooch-max rule. Probably he was the only one who used less than two ounces. Sacrilege! 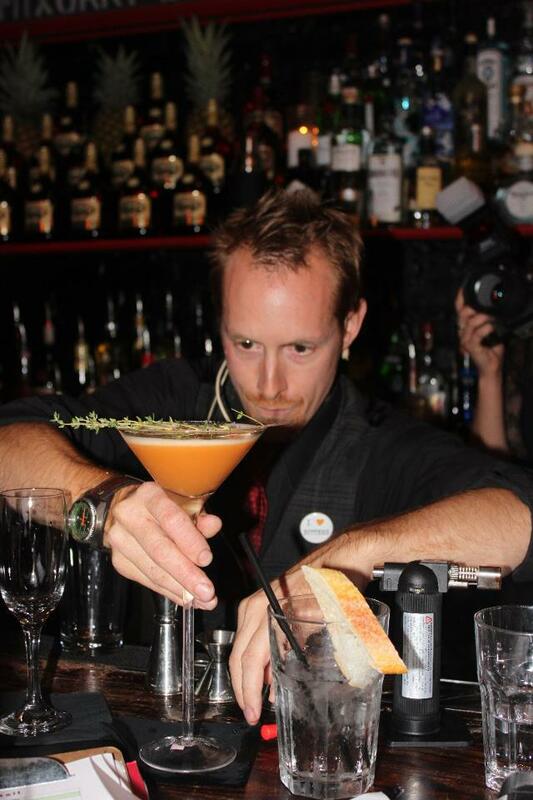 As Sam puts it, "Everyone tends to go complex in cocktail competitions. 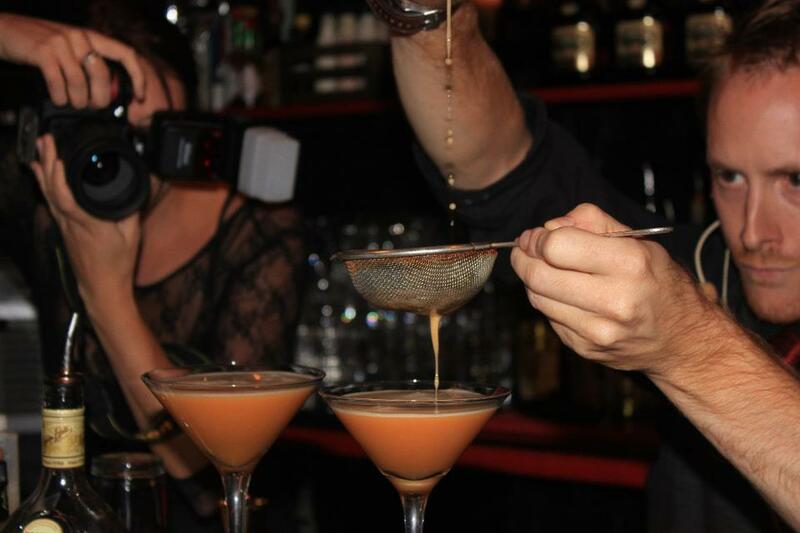 Mostly when they cannot infuse alcohol in regular bar situations, they go all out when they can! [Ed. 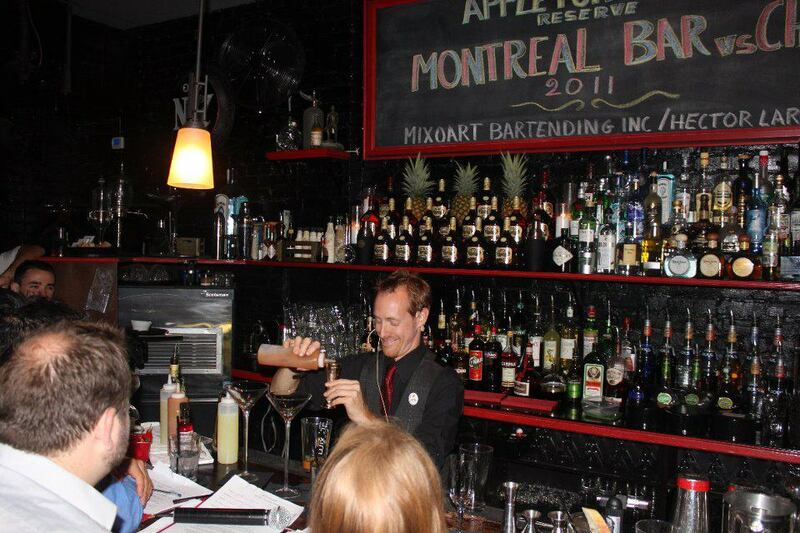 Note: In Montreal, it is illegal to serve infused alcohol. Don't even get me started.] I tend to go the other way and focus on the presentation. (oral and of the cocktail). [Ed. Note: I think that parenthetical was a bit of wobbly English on Sam's part, but you get what he means. And p.s. that's what she said.] From my experience, I don't think any judge will give a lesser note if a cocktail appears simpler if the overall balance is present." And so say all of us, Sam! Sam finished second in the competition, woot! Even better news for us, so long as you've got a juice presser at home -- for the smallish apricot, one of these would suffice -- his drink is easy to replicate chez vous. Combine rum, apricot syrup, apricot juice, lemon juice and the raw egg white from one egg into a shaker. Do a dry shake -- this is where you shake your liquid ingredients without ice. It's often recommended to first do a dry shake when dealing with raw egg white, and thanks to Sam for reminding me of such. For extra-fancy dry shaking, remove the coil from a standard strainer and drop it into the shaker first along with your ingredients, which acts like a whisk for the egg white. 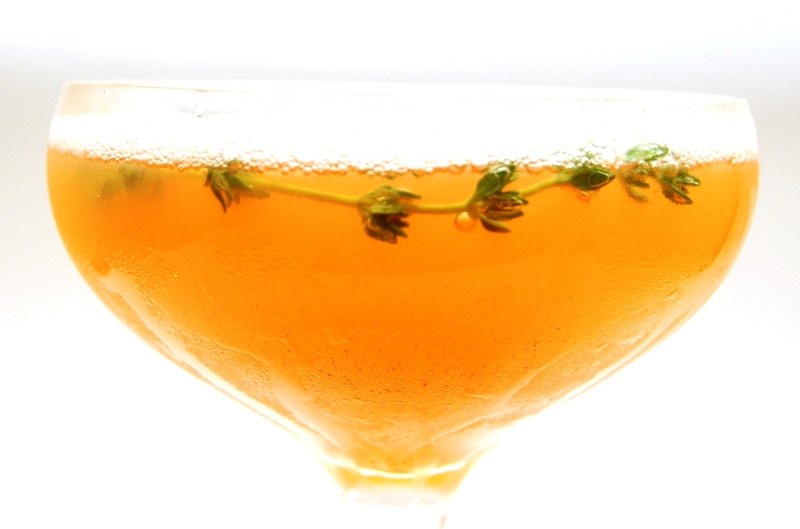 Muddle a sprig of thyme in the bottom of the shaker. Add ice and do a second ("wet," i.e. regular) shake. 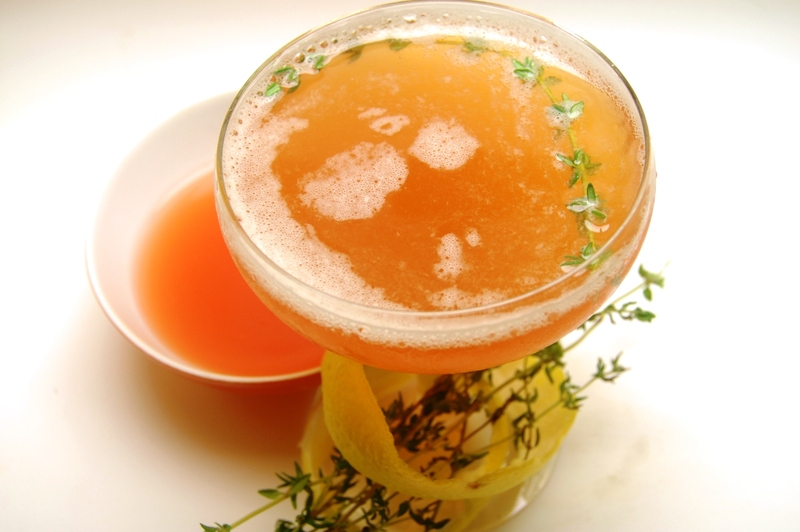 Strain into cocktail glass, add dash of Peychaud's and garnish with a second sprig of thyme across the lip of the glass.